In mid-May of 2014, I returned to dialysis treatments at St. Paul's Hospital in Saskatoon, after thriving for over 34 years, with a wildly successful kidney transplant. My brother Steven donated a kidney to me on October 17th, 1979. It was at Sunnybrooke Medical Center in Toronto, where I was living and working at the time, that I was originally diagnosed, at age 19, with End-Stage Renal Failure. Only a scant fifteen years prior to this, ESRF was pretty much an assured death sentence. At Sunnybrooke, there were highly trained kidney specialists who immediately recognized my symptoms. Thanks to this, I received an emergency operation that allowed the life-saving intervention of dialysis, the following day. Dialysis is a technological marvel that allows the kidney patient to have their blood cleansed by an artificial kidney machine. 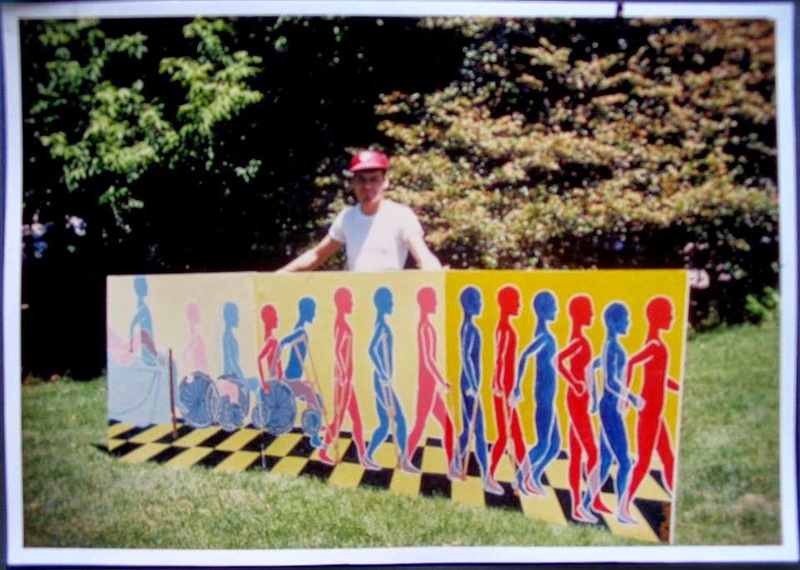 At age 19, I designed and painted the mural "Recovery 1", which I donated to Sunnybrooke Hospital in Toronto. My first response, after I felt better, was to design and paint a mural called “Recovery 1”, that I donated to Sunnybrooke Hospital in Toronto. My brush with an early death greatly influenced my artistic direction. Thinking of my artistic heroes, who had painted monumental murals that earned them a certain sense of immortality, I decided early on that I would not leave this life without leaving my mark on the art world. It was with this in mind, that I decided early on to carve out a career as a mural-painter. With this focus, I have in the interim designed and painted well over sixty large murals from coast to coast in Canada, with an emphasis in the past couple of decades in Western Canada. Working on the mural "March of Trinity" at Sacred Heart Chaldean Catholic Church in Saskatoon, SK. I've lived and worked for about twenty years in the beautiful Resort Village of Manitou Beach, since I met the love of my life, fellow artist Sharon Gibson. Together, we have established the seasonal business “G-G's Gallery and Gifts”, that has enjoyed modest success over the past six years. I am also an easel painter, and G-G's has created high-quality, sustained exposure of our artwork to thousands of visitors since its inception. The great thing about G-G's is, it has generated many exciting commissions for “heirloom-quality” portraiture (another of my specialties) and other artistic projects, along with generating many sales of original artwork. While my decision to pursue the career path of “monumental mural-painter” has been very fruitful, the question of precarious health lead me to reach out to the renal (kidney) community, to create a Facebook page called “Kidney Transplant Donors and Recipients”, where we welcome and embrace the renal community worldwide. We welcome anyone with a “kidney connection”, in all stages of their health journey. My wife Sharon originally came up with the idea to form this group, and she and I were the first members. After about two years, the group has grown to over ten-thousand strong! So, much as I hoped that my career as a muralist might assure a certain measure of immortality, the formation of KTDR has superseded this goal, as it is a living, thriving community. It has far exceeded my expectations, to say the least! And, it continues to expand its reach on a daily basis. Since I re-started thrice-weekly, four hour dialysis treatments, I have fast-tracked a writing project that I've dabbled in for a few years. Thanks to this dedicated “me-time”, I am just about ready to release Book 1 of a trilogy called, “Dancing with Rejection: A Beginner's Guide to Immortality”. Thanks in large part to my friend and mentor, the best-selling Saskatchewan author Wes Funk, I'm going ahead to self-publish. You might say, I don't really have the luxury of unlimited time to wade through “rejection” letters from the publishing houses. Don't you think it might be a bit ironic to stare down these notices for a project of this sort? 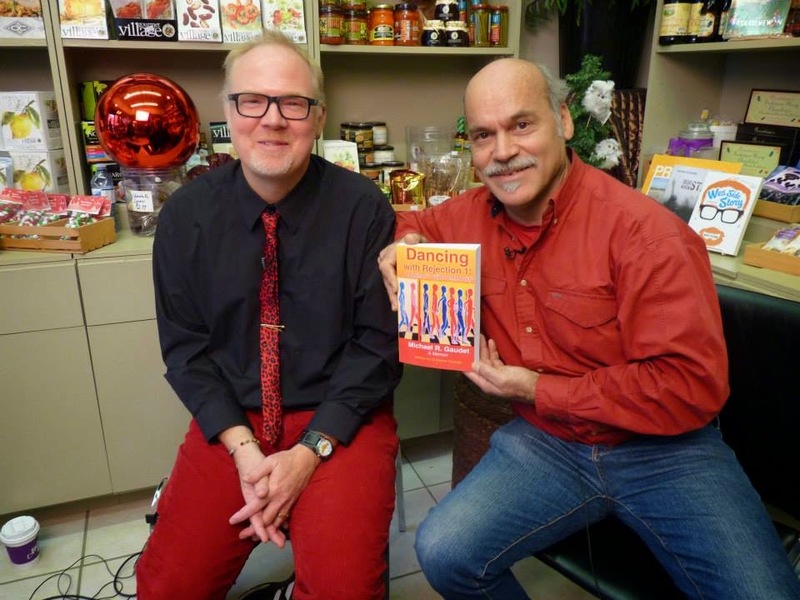 With Canadian literary darling Wes Funk, host of "Lit Happens" on Shaw Cable TV. To read more, and to follow the trajectory of the impending world-wide launch, please crank up your high-speed internet to visit www.mrgaudet.com.